The Temple Mount is open again after three years of being closed to non-Muslims. I've taken hundreds of photos there in the past month and share some of those below. A couple of these are in areas that aren't usually open to visitors. This issue includes the latest news and photos related to biblical sites, including the recent collapse of a wall on the Temple Mount and the dating of Hezekiah's Tunnel. 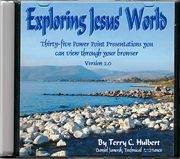 The featured resource this month is inexpensive and will be a great help to many readers. For several years, Israeli archaeologists had warned of an impending collapse of a wall on the Temple Mount. Ironically, the wall that buckled was a completely different one. The wall with the bulge was on the south side (see photos here), and this wall is on the west side and is not part of Herod the Great's retaining wall (it's a smaller wall on top of the Temple Mount itself). About 40 square meters (400 sq. feet) of a wall of the Islamic Museum collapsed on Sept 23, 2003. Archaeologist Dr. Eilat Mazar believes the collapse was caused by illegal and unsupervised construction activity on the Temple Mount. We took photos before the authorities covered it with a tarp and they are posted here. Arutz-7 has a fuller story and more photos. Antiquities Authority to sell potsherds? A proposal by senior officials in the Israel Antiquities Authority to sell potsherds is under discussion. Advocates of the move argue that the millions of worthless potsherds that have been collected in excavations could be sold to benefit the work of the authority, especially important in this time of economic crisis. Critics compare such a move to allowing the police to sell drugs. We don't understand the analogy or the argument. Haaretz has the full story. The Israel Museum has recently put on display a glass fragment with a gold leaf depicting the Second Temple of Jerusalem. The object dates to the 4th century and was discovered in the catacombs of Rome. The Haaretz article with a small photograph has been moved, but you can still see Google's cache of the page. A few months before the Israel Antiquities Authority declared the "James Ossuary" inscription to be a forgery, Christianity Today asked scholar Ben Witherington to write a related article on the "Top Ten New Testament Archaeological Finds of the Past 150 Years." The climax of the article was the ossuary, and when the verdict was announced, CT decided not to print the article. But they did post it online. It's written for a popular audience and one worthy of critique by armchair archaeologists. In a similar vein, noted historian Paul Maier has a brief article summarizing major points of contact between the New Testament record and the historical and archaeological record. His conclusion: "the sum total of the literary, historical and archaeological evidence from the ancient world dramatically supports the New Testament record on Jesus. Those who claim it does not are sadly misinformed, tragically closed-minded, or dishonest." More recently, Witherington has written an excellent piece explaining why the IAA conclusion that the James Ossuary inscription is a forgery is very problematic. If it is authentic, Craig Evans has four facts that are learned or confirmed from the discovery. The advantage of these CDs is that they include "the whole package" for teaching - photographs, maps, outline, and notes. If you teach these subjects, you will easily find enough material to make it worth the price. You can find more information at the bottom of this AncientSandals.com page. After three years, the Temple Mount was recently opened again to non-Muslims. I've had the chance to visit several times in the last month and take hundreds of photos. Some of those photos will be featured in this and next month's newsletters. These high-resolution photographs may be used for personal and educational use. Commercial use requires permission. Click picture for higher-resolution version. One thing many visitors to the Temple Mount are surprised by is the amount of space in the area. Herod built the complex to hold hundreds of thousands of people, and today it still does (during Muslim feasts when political conditions are right). Another surprise to many is the amount of trees and greenery. It's not difficult to find a shady spot and take a nap (and many Muslims do). Ever since the first Western visitors, the rules for non-Muslims on the Temple Mount have grown progressively more restrictive. The foolish actions of those like "archaeologist" Montague Parker and the deranged Australian tourist who set fire to Al-Aqsa Mosque didn't help the situation. The king of Jordan was assassinated (by another Muslim) on the Temple Mount in 1951. One change on the Temple Mount since it closed three years ago is a walkway around the edge of the Temple Mount. This includes a path next to the Golden Gate. Previously, Muslim sensitivities did not allow a visitor to come within 50 meters of the gatehouse. One can only wish now for entrance inside the structure. But don't hold your breath. This is the area that was a discussion in the news for several years. The Muslims have constructed a mosque underneath the Temple Mount platform in the area known as "Solomon's Stables." In order to improve safety for the 10,000 worshippers that can fit in the mosque, a new entrance/exit was built, requiring several large tunnels and a large staircase to be excavated. Unfortunately no archaeological supervision was present during the removal of the massive quantities of earth. Before entering the mosque to pray, Muslims are required to wash their hands and feet. Entrance to the mosque is without shoes, for visitors as well. Though the Temple Mount is now open, strangely the Dome of the Rock and Al-Aqsa Mosque, for which a fee is charged, are not open to visitors. 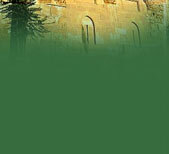 You can help us and others by forwarding this link to friends, pastors, teachers, and students interested in Israel, the Bible, archaeology, photographs, and/or teaching materials related to the same. We do our best to inform you of the best resources (not just our own!) for the subject. Sharing this newsletter with others helps us in our efforts.